KUALA LUMPUR: Animal rights activists in Malaysia have praised the government’s announcement of an underpass to be constructed on a stretch of highway near Ipoh in the northern Peninsula to allow animals to pass through unharmed. According to State Wildlife and National Parks Department Direcctor Abdul Kadir Abu Hashim, construction of the one kilometer underpass will begin next year and is aimed to allow wildlife to safely cross the East-West Highway near Pulau Banding. “We choose the site as studies conducted by the department found that most wildlife passes that area. “The government has, in principle, agreed on the site,” he was quoted as saying to the New Straits Times. The RM60 million project will be established between Grik in Perak and Jeli in Kelantan, near Ipoh. Besides the Pulau Banding site, the government has also approved similar projects in Terengganu and Pahang, costing RM110 million. 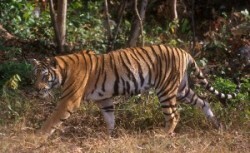 The move has been met with much praise and optimism from the animal rights community and ecologists who have reported tiger populations are being broken and fragmented due to human development. A number of animals have been killed or injured while attempting to cross the busy highway. “It will also allow safe passage between conservation corridors such as the Greater Taman Negara and Belum-Temengor Priority Tiger Landscape,” said the department. The goal, Abu Hashim argued, is to develop numerous such projects over the next few years, but said it depends on the success of the initial passes on the roads.